NASA has selected Garvey Spacecraft of Long Beach, Calif., for a Small Business Innovation Research (SBIR) award for work on the development of a nanosat launch vehicle capable of lifting up to 20 kg into low Earth orbit. The maximum amount available under the space agency’s six-month SBIR Select Phase I award program is $200,000. Garvey plans to use the award for “the continued functional evolution and concept refinement of an incremental series of test vehicles” to serve the nano- and micro-sat launch markets. Initial versions of the launch vehicle will be capable of delivering 10 kg payloads into a 250 km orbit. The ultimate goal is to place satellites weighing up to 20 kg into a 450 km orbit. A synopsis of the project follows. The technical innovation proposed here is the continued functional evolution and concept refinement of an incremental series of test vehicles that will ultimately provide dedicated, low-cost, reliable, on-demand routine space access for the emerging nano and micro satellite markets. Initial orbital operational capability for delivering 10 kg to a 250 km circular LEO is achieved with a two-stage, pressure-fed “10/250” Nanosat Launch Vehicle (NLV) that will pathfind performance, production, regulatory and operational challenges. This NLV will then be followed by a clustered “20/450” Nano/Micro Satellite Launch Vehicle (NMSLV) that addresses this topic’s primary objective of providing a capability to place nano and micro satellites weighing up to 20 kg into 450 km circular LEO. Aggressive leveraging of our team’s existing NLV development initiative enables significant hardware development and the start of static fire testing during Phase I, followed by actual flight testing in Phase II for TRL-7 technology evaluations. These tests have incrementally introduced state of the art capabilities like advanced propellants (LOX/propylene) and structures (composite cryogenic tanks). 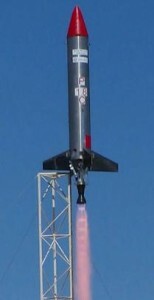 The Phase I effort focuses on the development of the next class of test vehicle – a high altitude suborbital single booster stage (the “P-K”) that features closed-loop thrust vector control (TVC) and candidate avionics technologies for guidance and navigation, as well as eventual autonomous flight termination systems (AFTS) for range safety, TRDRSS-based telemetry and tracking functions. In addition, it will incorporate features needed to implement the clustered first stage configuration and second stage separation method associated with the 20/450 NMSLV. The Phase II effort will then focus on the further development of an NMSLV-type first stage with two additional core boosters, for a total of three, and the conducting of a high-altitude demonstration flight. Currently, 10/250 NLV-class test vehicles are already providing suborbital reusable launch services for NASA. The next generation of such pathfinder test vehicles developed under this program will extend the test envelope for enabling launch technologies and operations needed to effectively implement orbital NMSLV-based operations. Longer term, the NMSLV configuration that emerges from this effort will be able to support such NASA programs like LSP’s ELaNA and the Edison small satellite research initiative. These can then be followed by launch and maintenance of global monitoring systems that feature low-cost CubeSat-class spacecraft. Current NLV-class test vehicles are now being used to manifest and evaluate a variety of new launch vehicle technologies, including composite cryo propellant tanks, alternative hydrocarbon fuels (methane, propane and propylene), wireless data networking, and advanced vortex engines under TRL-6 and 7 environments. The next generation of NMSLV-based test vehicles will expand these to TRL 8 and 9 conditions, while still providing secondary payload opportunities for small developers and STEM initiatives. Longer term, the resulting operational NMSLV can support the implementation of CubeSat-based commercial earth monitoring constellations, global space weather monitoring constellations for the Air Force, and rapid response for such organizations as the Army’s SMDC and DOD Special Operations Command, as well as providing dedicated launch services for the DOD Space Test Program, Operationally Responsive Launch Office and the NRO’s Colony II initiative. Nope. Sorry. You are wrong. Go back and read NASA’s press release and follow the trail they laid out. Then report back on what you find. This should be really easy. 5. Click on the link for the Garvey Spacecraft Corporation project summary show above. Please report back to us on what you find. You will find that the selection was announced on Wednesday, not a year ago. It was announced on Wednesday.